Aircraft veered off runway and overturned. RIO VISTA — A escaped without injury after a small plane overturned during landing at an airport, authorities said. The plane, an Airdrome Sopwith Pup with a tail number of N1916Z, was landing at Rio Vista Municipal Airport about 12:30 p.m. Monday, Federal Aviation Administration spokesman Ian Gregor said. Federal Aviation Administration records list the plane as a fixed-wing single-engine model built from a kit. No information was immediately available about the circumstances that led to the crash or any plane damage, but Gregor said the FAA will investigate. 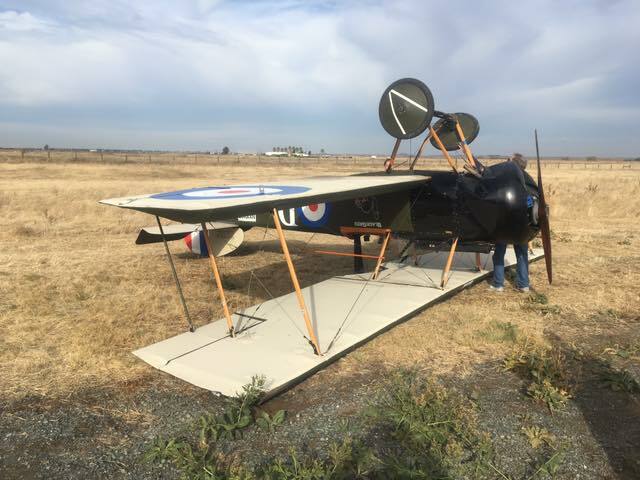 RIO VISTA (CBS13) — A man flying a World War I replica biplane flipped over Monday while practicing landing in crosswinds at Rio Vista Municipal Airport, police said. Police said the plane caught a gust of wind and flipped over in the landing, but the pilot was able to walk away unharmed. Both Rio Vista police and firefighters responded to the incident. Officials closed the runway for two hours while righting the plane and moving it to a hangar. The man was flying an Airdrome Aeroplanes Sopwith Pup.